The multi-protocol communications gateway is designed for Benchmark or KC1000 boilers, KC1000 water heaters, and Aerco’s steam-to-water and water-to-water heaters. The package supports integration with BACnet and LonWorks systems to provide up to 300 customer-selected data points from the product's C-More™ or ECS unit controller, or from the BMS multiple-unit control system. 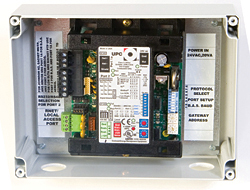 The gateway is packaged in a UL-recognized plastic enclosure users can install on a wall or with a steel mounting bracket.